On August 15, 2018, Mr. Jason Fraser, USAID/Jamaica Country Representative, visited Spring Village Development Foundation (SVDF), a community-based organization in St. Catherine, Jamaica. The visit was planned and organized by the USAID-funded Local Partner Development (LPD), to provide insight on LPD’s drive to increase the capacity of civil society organizations and make them better positioned to provide jobs, social value, and hope to Jamaican communities. 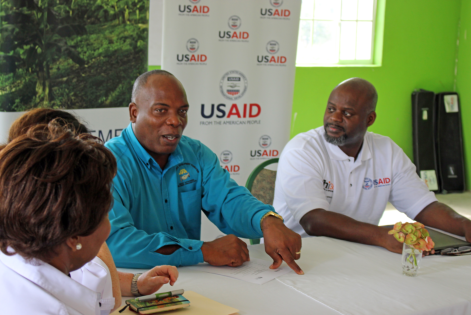 The visit was also an opportunity for USAID/Jamaica to meet with members of the Central Jamaica Regional Working Group. LPD has established regional working groups in central, western, and eastern Jamaica, to facilitate a method of cooperation where civil society organizations can network and collaborate towards common goals of making vulnerable and volatile communities safer, more cohesive and more resilient. The site visit to the Spring Village facility featured a tour and discussion on SVDF's contribution to the community, its 20-year history and achievements. SVDF has recently been selected to participate in LPD’s Pathways to Sustainability Program, to receive intensive institutional strengthening support geared towards improving organizational performance and sustainability. Mr. Fraser, for whom this was the first site visit since he assumed the post in Jamaica, lauded the progress made by the SVDF, and took the opportunity to speak to students in an Entrepreneurship Training module to encourage their efforts. Other aspects of the tour included a walk-through of the computer lab, hospitality, wellness, creative arts and agricultural science wing.